A mother Pteranodon accompanies Bright Eye as she learns to fly. One purpose of this preliminary drawing was to represent the idea that juvenile pterosaurs were aerodynamically capable of flight before they reached adult size. 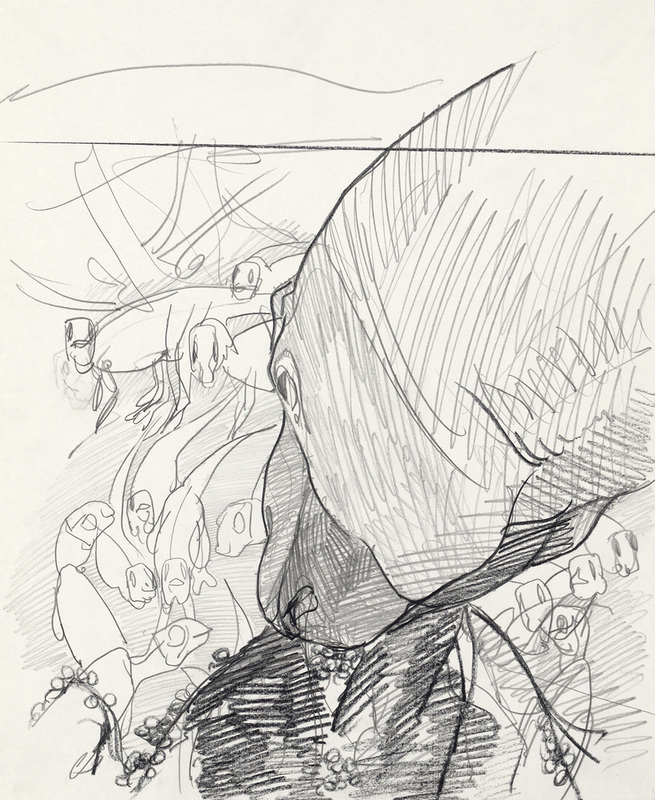 Pencil on paper, 14 x 17 inches, 1983. 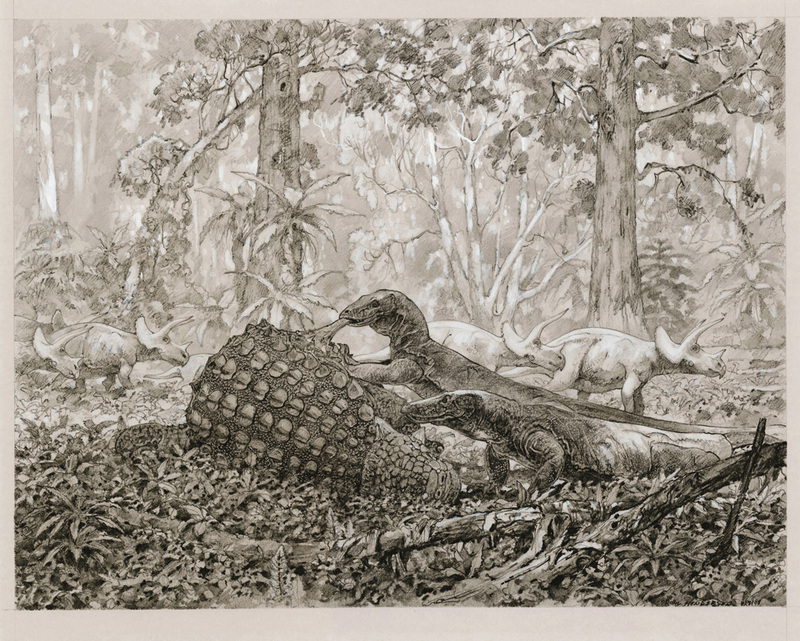 A compostional drawing of an adult Maiasaur above her nest of hatchlings. Pencil on paper, 14 x 17 inches, probably 1984. A preliminary drawing of the Cretaceous ancestral Rockies with foothill volcanics and upland plains. 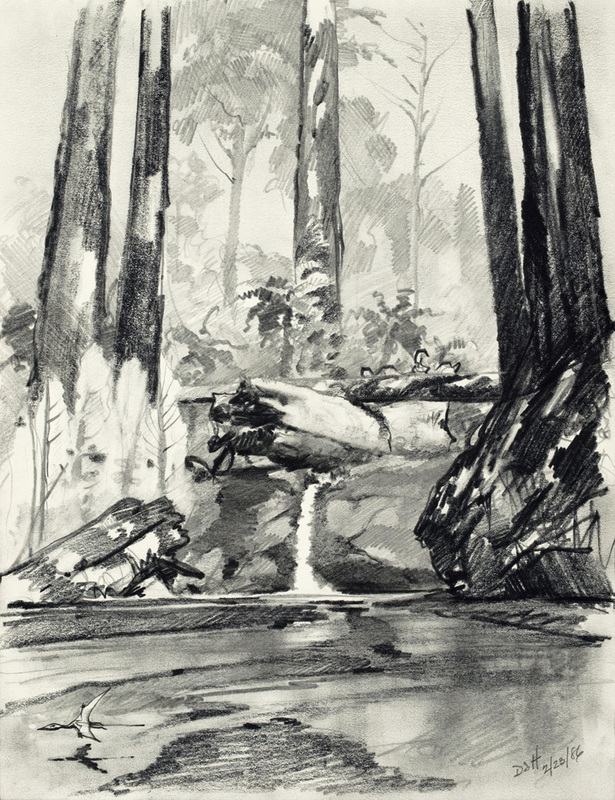 Pencil on paper, 14 x 17 inches, 1985. 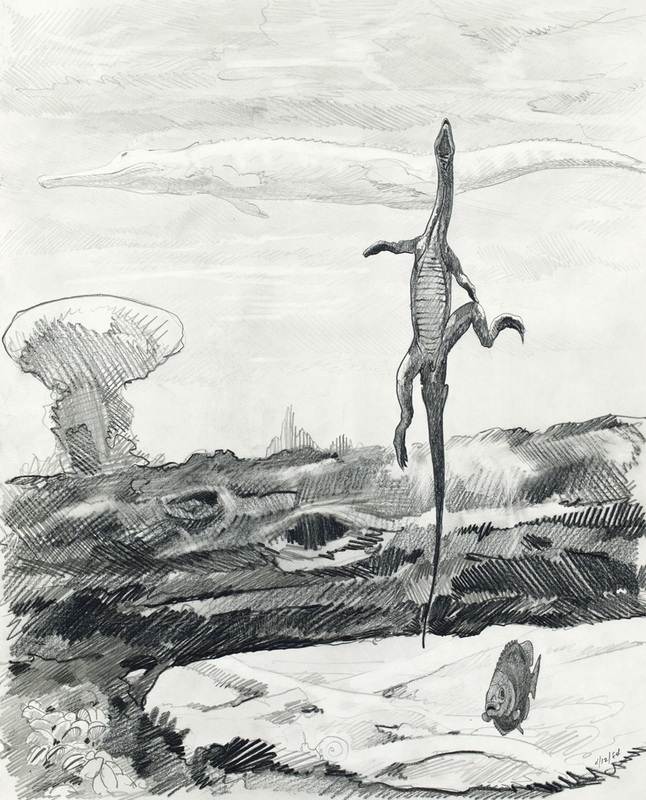 One of the first Triassic preliminary drawings related to the Chinle of Petrified Forest National Park. Pencil on paper, 14 x 17 inches, 1984. Wash study of the volcanic Mogollon Highlands, the origins of streams and rivers that crossed the Petrified Forest flood plains. 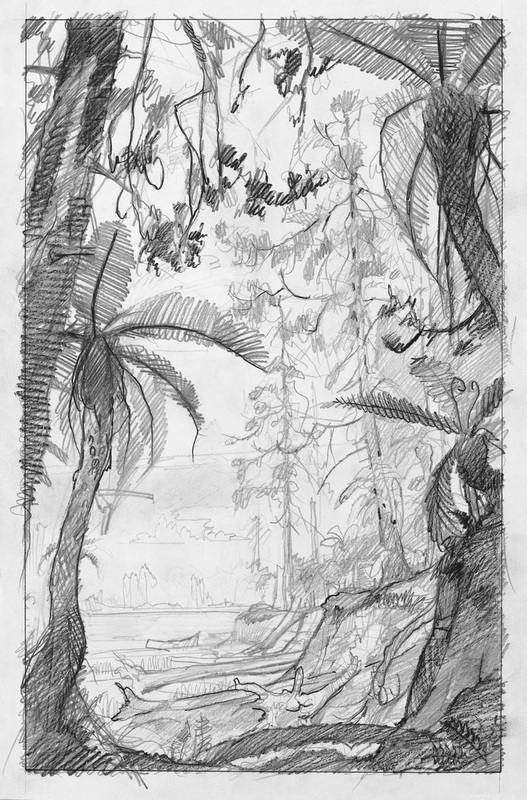 Preliminary drawing of an upper Chinle Forest along a stream course flowing toward the Petrified Forest lowlands. Pencil on paper, 9x12 inches, 1986. 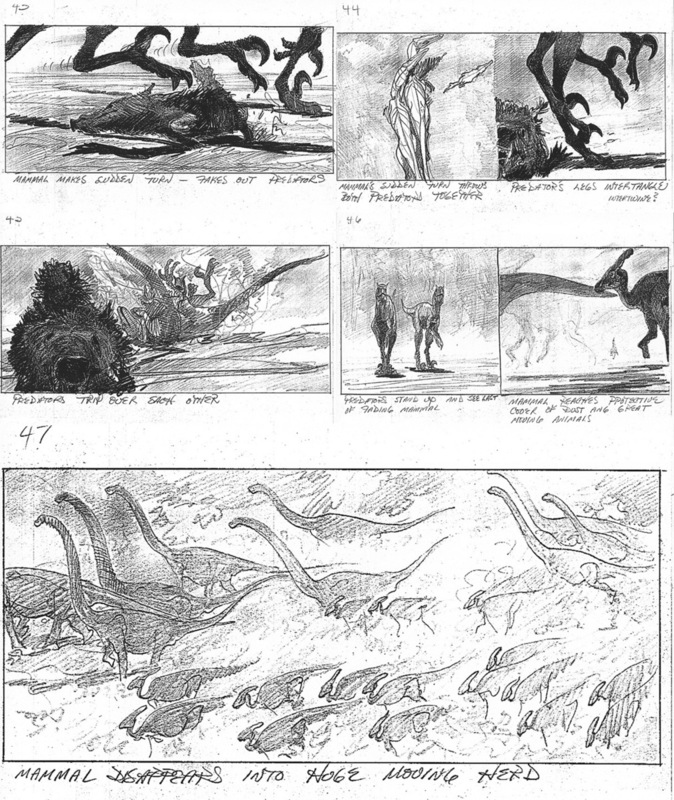 Photocopied pencil storyboard sequence (1-6) of a Tyrannosaur stalking a group of Edmontosaurs (Anatotitons) done for a nixed National Geographic stop-action animated project. 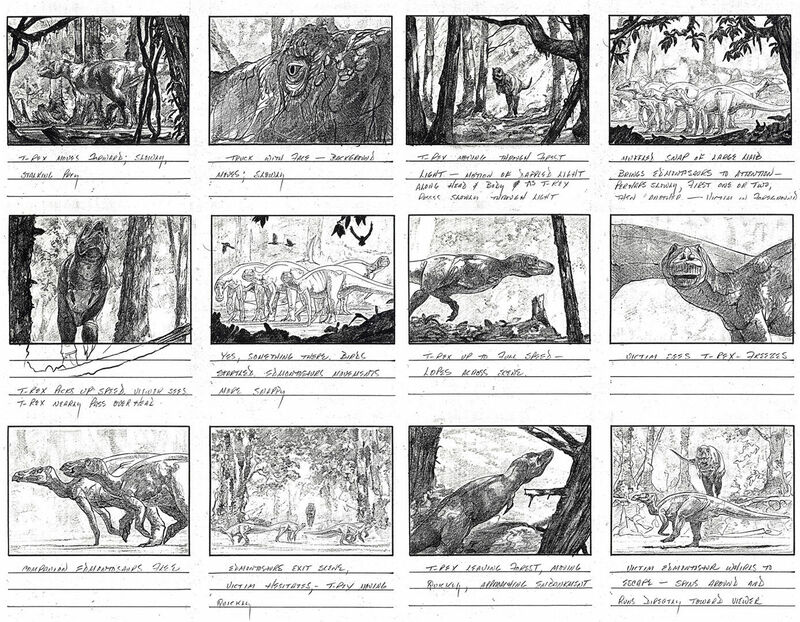 Photocopied pencil storyboard sequence (7-12) of a Tyrannosaur stalking a group of Edmontosaurs (Anatotitons) done for a nixed National Geographic stop-action animated project. 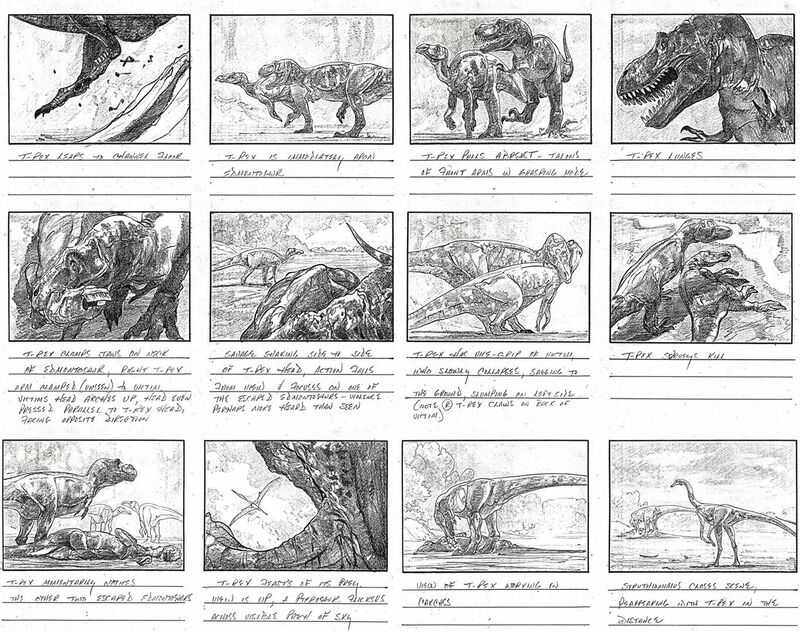 Photocopied pencil storyboard sequence (13-18) of a Tyrannosaur stalking a group of Edmontosaurs (Anatotitons) done for a nixed National Geographic stop-action animated project. 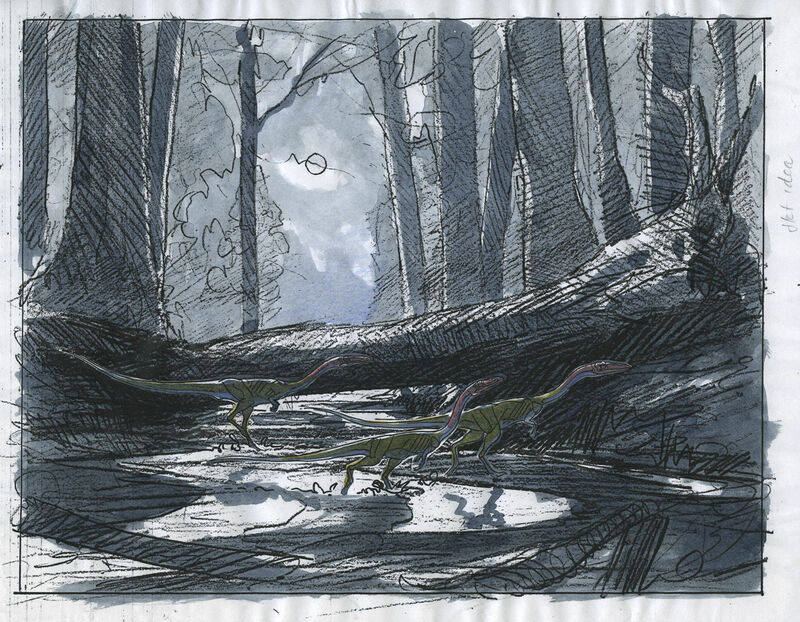 Preliminary book cover design of running Coelophysis in moonlight with editor comment. A photocopied pencil drawing rendered in ink wash, bond paper, 8.5 x 11 inches. 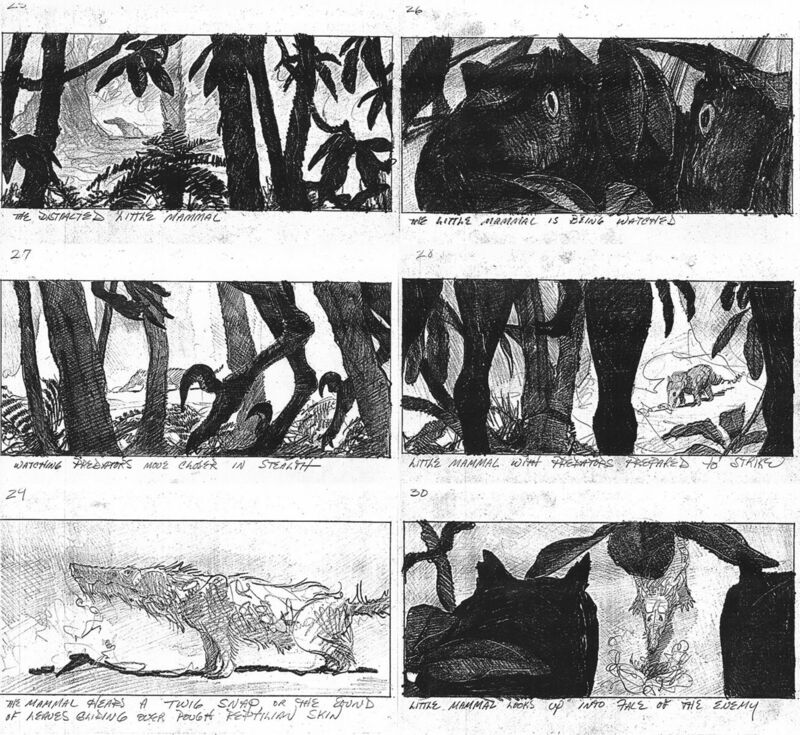 Photocopied pencil storyboard sequence of Cretaceous mammal and two hungery predators. 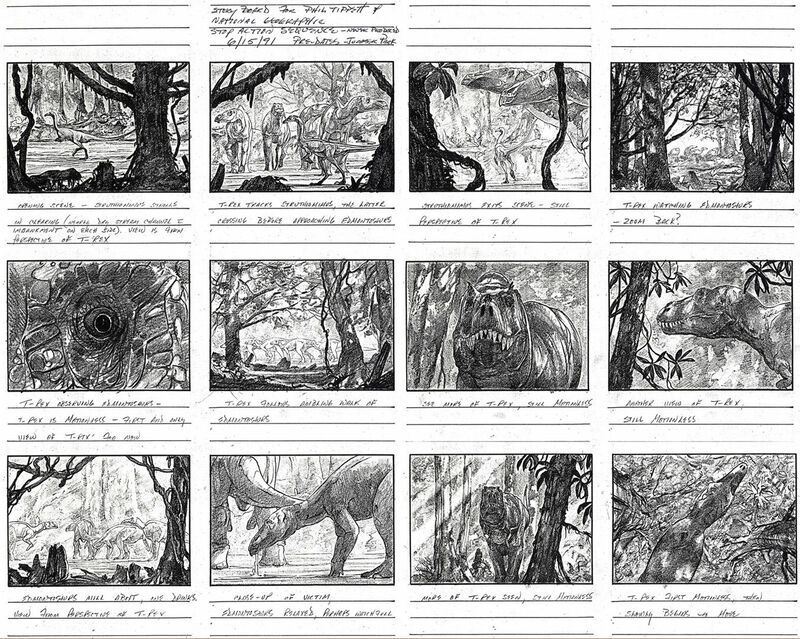 Done during development of Disney's feature animation Dinosaurs. 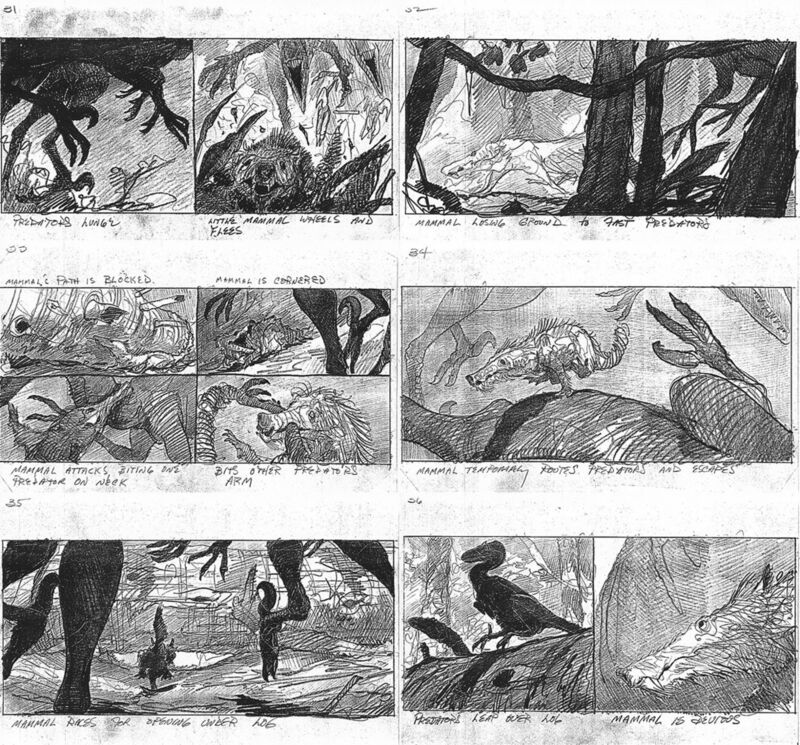 Compositional design done for Disney's feature animation Brother Bear. Pencil and white ink on toned paper, 5.2 x 12.75 inches, 2000. 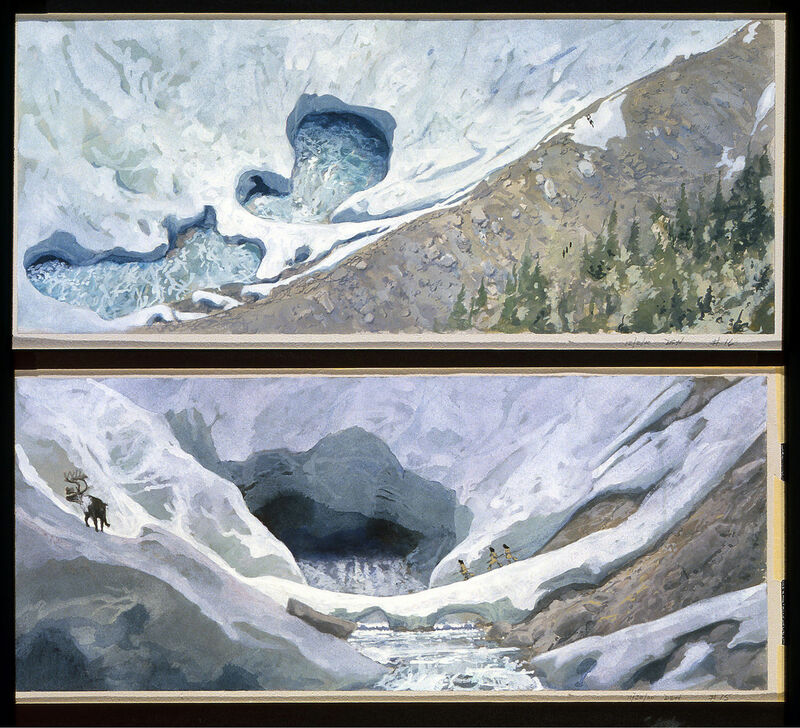 Two compositional designs done for Disney's feature animation Brother Bear. Pencil and white ink on toned paper, 5.2 x 12.75 inches each, 2000. Pencil and graphite dust on bristol, 5.2 x 12.75 inches, 2000. Pencil and opaque ink on toned paper, 5.56 x 14 inches, 2000. Pencil and graphite dust on bristol, approx. 6 x 14 inches, 2000. Pencil and graphite on bristol, approx. 6 x 14 inches, 2000. 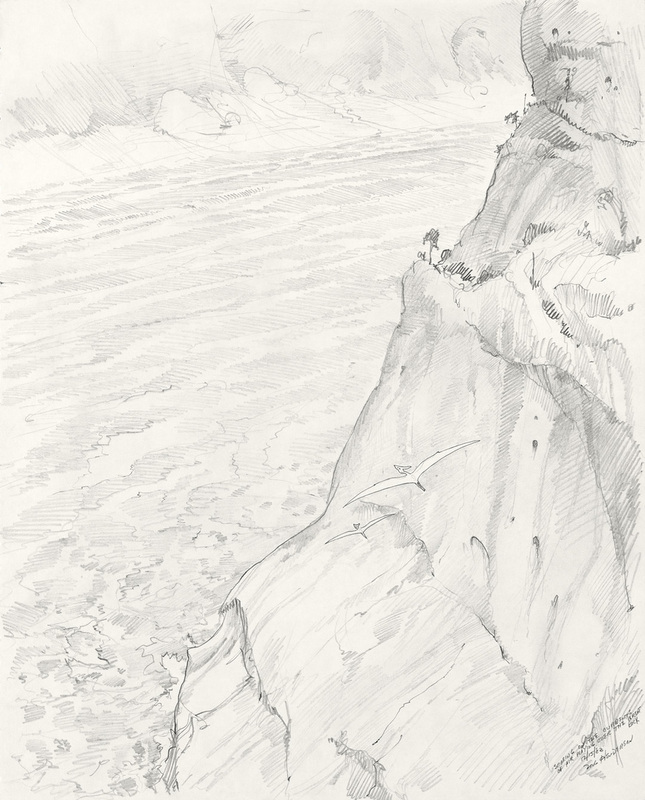 Pencil on paper, 5.4 x 12.75 inches, 2000. Pencil and graphite dust on bristol, 5.4 x 12.75 inches, 2000. Preliminary work for Disney's feature animation Brother Bear. Pencil, watercolor and opaque inks on toned paper, approx. 6 x 14 inches, 2000. Opaque ink on toned paper, approx. 6 x 14 inches, 2000. Opqque inks on toned paper, approx. 6 X 14 inches, 2000. 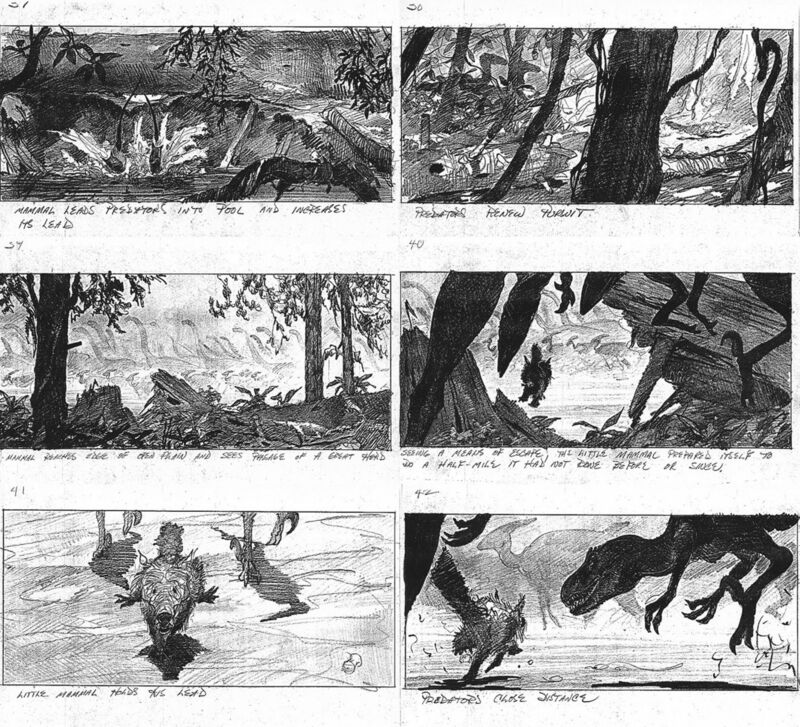 Two panels from a storyboard sequence depicting a caribou hunt, done for Disney's feature animation Brother Bear. Opaque inks on toned paper, approx. 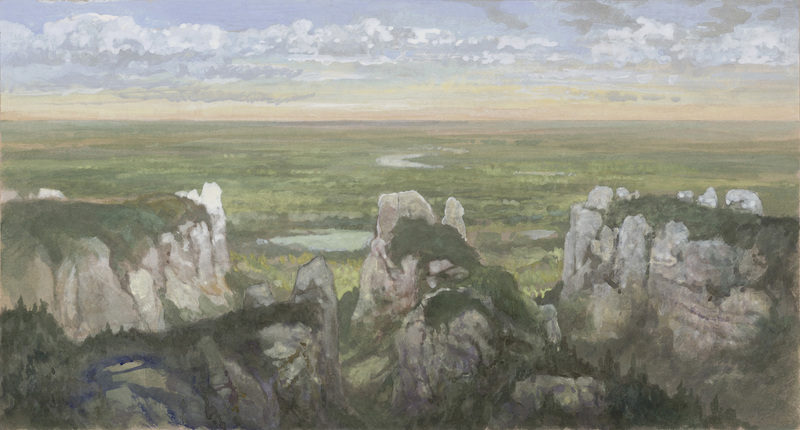 6 x 14 inches, 2001. 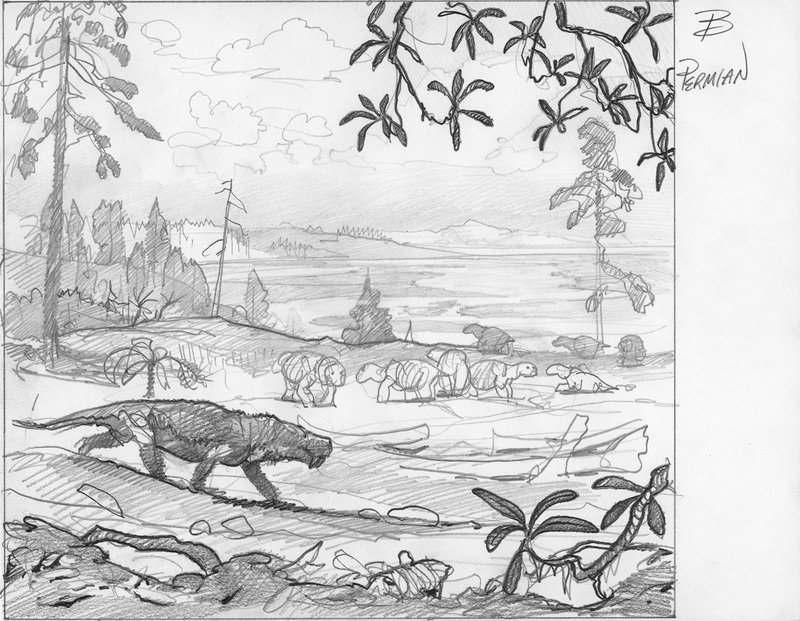 Compostional sketch of late Permian South Africe, done for the Florida Museum of Natural History. Pencil on bond paper, 8.5 x 11 inches, 2003. Preliminary design depicting the drift of New Zealand from Austraiia. 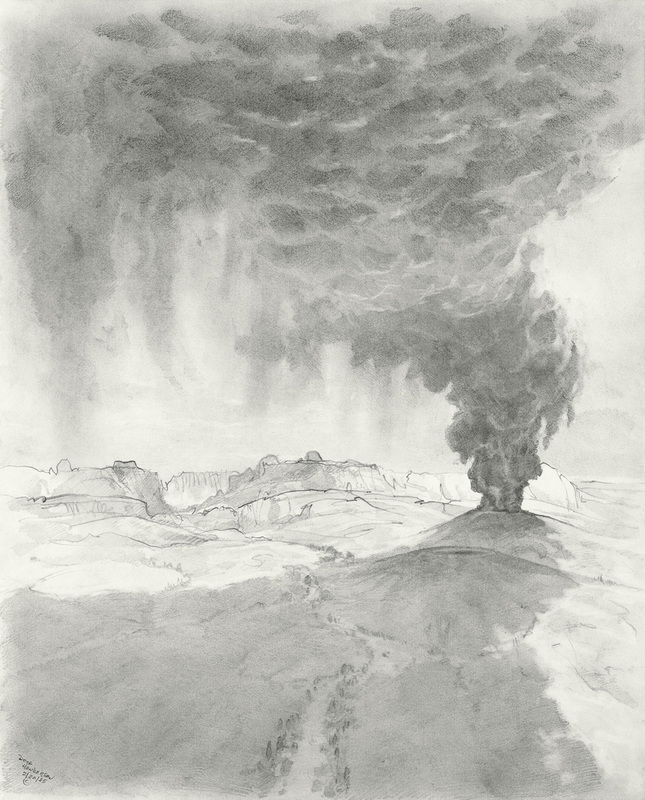 Pencil, watercolor and opaque ink on toned paper, 6.18 x 16.25 inches, 2006. Design drawing done for a Tony McVey project. Pencil and white ink on toned paper, 11.3 x 14.75 inches, 2008. 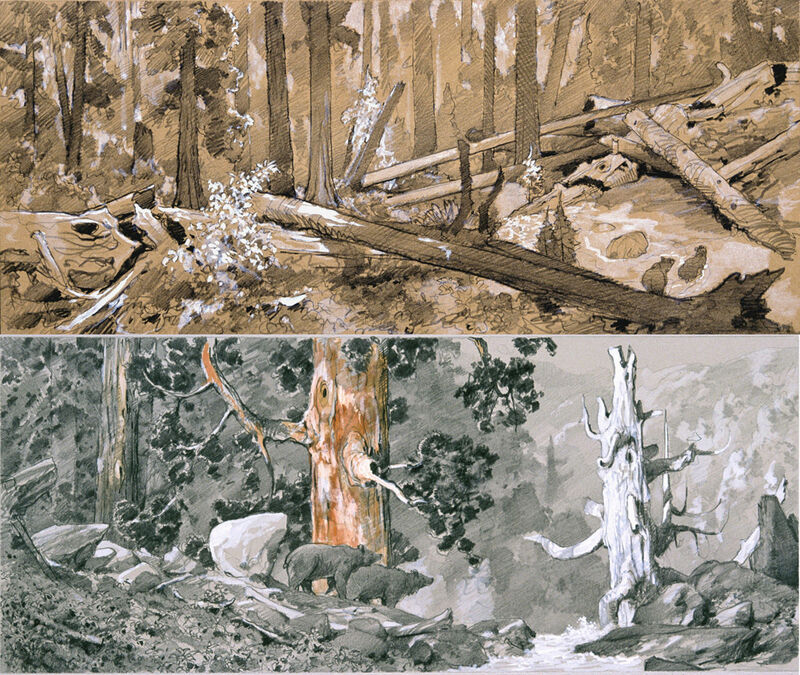 Compostional design for a drawing to be reproduced as a large wall mural for the Natural History Museum of Utah. Pencil on paper, approx. 10.5 x 15.25 inches, 2010. 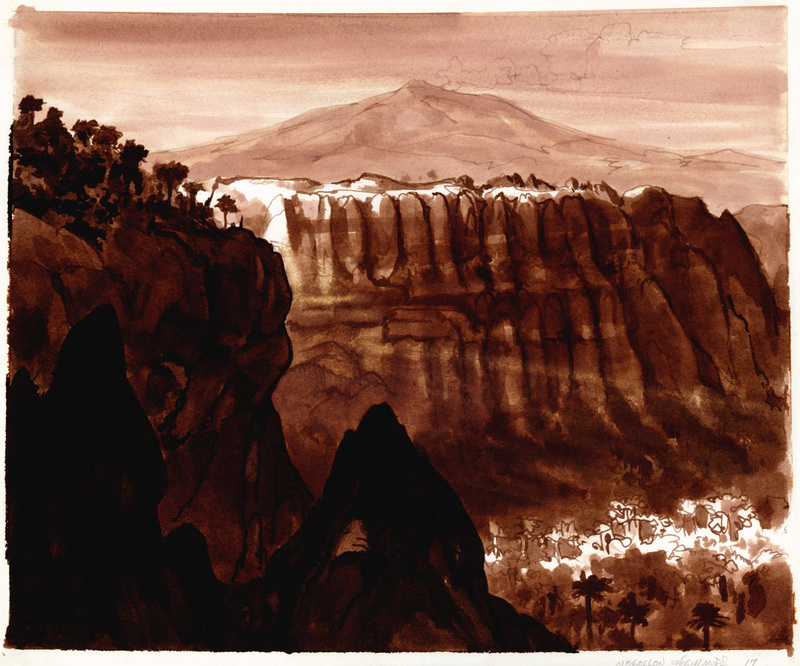 A design drawing of Cambrian age limestone forming mountain front cliffs and canyons above a Cretaceous upland plain in western North America. Gouache and opaque inks on toned paper, 7 x 13 inches, 2013. A sample of preliminary and design work done for books, museum exhibits and a few animated features.